Position yourself to succeed and avoid costly mistakes with the free Starting a Successful Business workshop. If you are about to embark on a new venture, or if you just recently opened the doors to your own company, the timing is perfect to attend. In today’s marketplace, small businesses need a partner to provide support, experience, and expertise – let us help! Programs and services are provided to the public on a non-discriminatory basis. Language assistance services are available for limited English proficient individuals. Reasonable accommodations for persons with disabilities will be made if requested at least two weeks in advance. 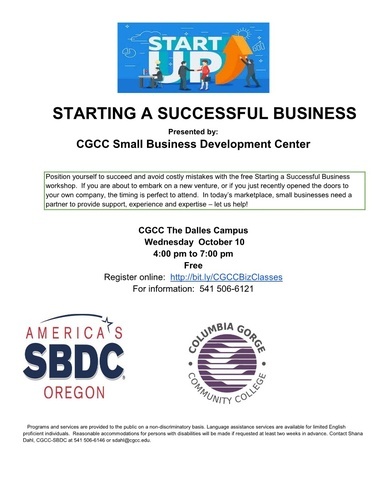 Contact Shana Dahl, CGCC-SBDC at 541 506-6146 or sdahl@cgcc.edu.